I love everything about food. I love cooking, eating, watching people cook, even watching people eat(mukbang??). I love slowly strolling through the grocery store late at night looking for new ingredients with no real sense of urgency. I’m always looking for inspiration but sometimes it happens to strike in the oddest of places. Fast forward to a few weeks ago. I’m on the tail end of a 2 hour YouTube spiral when the most amazing video pops onto my radar. Don’t ask me how, but sometimes YouTube knows what I want to watch more than I even know. It’s a 2 hour long video of Indian Street Foods…I couldn’t look away. 2 hours later I stumble to bed, almost able to smell the Indian night markets, with 1 mission in mind. I had to recreate a Spicy Egg Curry dish just as I’d seen in the YouTube video. This dish is so far removed from anything I’ve made previous that it felt like an adventure every step of the way. It started with me researching classic Indian spice combinations, and boy is that ever an interesting path to go down. There are so many unique spices that I’ve never heard of before, let alone cooked with. 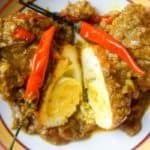 Luckily for me all the spices needed for this spicy egg curry are ones I’ve used before and am fairly comfortable with. However, if you’re new to cooking Indian food you may need to stop at your local Indian Grocery and pick up a few things. You’re going to need Garam Masala powder for this dish. This is a spice you’ll be using a lot in Indian cooking so run out and grab some. You’ll also need tumeric. That can be found at most grocery stores these days, but grab it from the Indian Grocery if you can since it will be about half the price. The rest of the ingredients are standard fair. You might not have fresh Thai Chili on hand, but you can sub that out for red pepper flakes. Once you’re equipped with your eggs, the next step is to determine how crispy you want them. This is really up to you. I’ve seen this dish prepared without frying the eggs in the pan at all, just topping hard boiled eggs with the curry sauce. I’ve also seen the eggs split in half and seared with the yolk face down. There are a bunch of different paths you can go down with your spicy egg curry, and I’m sure they’re all delicious as long as you get the spicy curry sauce right! The sauce is the key to this dish. The egg is pretty much going to taste like an egg no matter how badly you mess it up, but the sauce is not so forgiving. This sauce is best using as much fresh ingredients as you can. You can sub out the fresh ginger, garlic, shallots, and chili for dried versions, but you’re going to be missing the full depth of flavor in the final product. It’s also important to give the spices a bit of alone time in the pan to liven up the flavors and allow them to express themselves. It’s easy to get stuck in routines. Wake up, go to work, come home, make the same chicken breast dish for the 17th night in a row. Break the routine! There’s no better way than stepping totally out of your cooking comfort zone with a dish like this spicy egg curry. Finely dice the ginger, garlic, shallot and Thai chili(remove seeds to reduce the heat level). Grate the nutmeg. Peel the hard boiled eggs. Heat 1 tbsp of ghee on medium heat in a nonstick pan. Add the hard boiled eggs and cook until the eggs have a crispy exterior. Remove eggs and set aside. Add the ginger, garlic, shallots, and chili to the pan with the remaining ghee. Allow it to cook down for a minute(don't let the garlic burn). Now add the remaining spices, mix, and cook for 1 minute (this will bring out the flavor of the spices). Add 1/2 cup of water(you can opt for coconut milk to reduce the spice of the dish and give it a Thai twist) to the mixture and turn the heat on high. We will now start reducing the curry mixture down. When the water is almost completely gone and the curry is a paste, add the eggs back in, along with 2 whole Thai chili's and cook for another 1 minute while stirring.